The Jets may have gotten it right with Christian Hackenberg — by finally cutting him. The quarterback’s first regular-season action as a pro didn’t start or end well. He’s still looking for his first points. 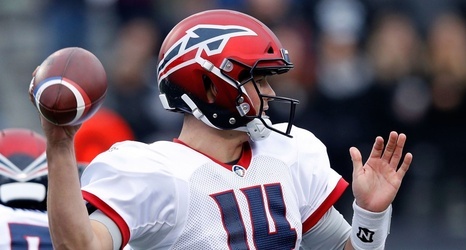 The former Jets draft bust threw a first-quarter interception and his Memphis Express team was shutout 26-0 by the Birmingham Iron in his Alliance of American Football debut Sunday in Birmingham, Ala.
“We took it personally that we couldn’t put points on the board,” Hackenberg told the team’s official website. Hackenberg, the Jets’ second-round pick in 2016, completed 10-of-23 passes for 87 yards and was replaced by former Troy standout Brandon Silvers in the game’s final four minutes.